The London Group was formed by an amalgamation of the Camden Town Group and the English Cubists (later Vorticists) in 1913. This grouping of radical young artists came together as a reaction to the stranglehold which the Royal Academy had on exhibiting new work. Founder members included Spencer Gore, Wyndham Lewis, Sickert and Epstein. The London Group decided on a written constitution and a number of officers to run the Group’s affairs. Members were to be elected to the Group based on a democratic election. A Working Party was set up to organize London Group exhibitions which were to revitalize contemporary visual art, bringing in new European developments in painting and sculpture, especially from France. Artists exhibited their own choice of work. The London Group made no judgmental decisions on members’ work, a tradition proudly defended to this day. The beginning of the First World War and the early death of the first President, Harold Gilman, were inauspicious moments for the new group, yet it survived and, in the Twenties, developed into a progressive and critically acclaimed venue for contemporary artists. Roger Fry and the Bloomsbury set were extremely influential in the Group during this decade. The Thirties saw a greater diversity of activity. There was a healthy exchange between the more objective Cézanne salon and the Surrealists, for example. Again, the Group survived another World War, managing to mount exhibitions throughout the early Forties. As Europe healed its wounds The London Group was to enter into a golden period in the 50’s and early 60’s. There were regular, affordable venues to hold annual exhibitions, large enough to offer space for every member to show more than one work and to invite non-members through open submission. The highlight of this period was The London Group Jubilee Exhibition held at the Tate Gallery in 1964. In the 1970s The London Group became the major vehicle for young artists emerging from art school in the way the Young Contemporaries was for art students. It held major open exhibitions across London including the Royal College of Art, The South London Art Gallery and Camden Art Centre. The nature of contemporary visual art and its consumption began to change and diversify and this change was reflected in the membership and exhibition strategies of the Group. The London Group’s 80th Anniversary Exhibition, held at the Concourse Gallery, Barbican in 1993 was launched by Lord Gowrie, the then Minister for the Arts. The 90th Anniversary Exhibition in Cork Street saw the launch of The London Group website and a commemorative yearbook published in 2003. 2013 saw the Group celebrating its Centenary with four major exhibitions and a collaboration with Ben Uri Gallery. One of the exhibitions was an open submission exhibition, with more highly successful ‘Opens’ in 2015 and 2017, all three shown at The London Group’s home, The Cello Factory in Waterloo. In 2014 the anniversary of the first London Group exhibition held in 1914 was celebrated with two exhibitions, “The London Group on London” at The Cello Factory and “From David Bomberg to Paula Rego: The London Group in Southampton” at Southampton City Art Gallery. The Group also experimented with Small Group Exhibitions (SGEs) where the diverse approaches of members’ work could be accommodated outside of a full-members show. Recently, engaging pop-up exhibitions have emerged, at locations such as car parks and a church crypt and churchyard. A programme of Salons was also organised, evenings where members could get together to informally discuss issues of their choosing. The Group has spread its wings to show away from The Cello Factory in London, notably Mottisfont Abbey in Hampshire, Shoreham Village in Kent, Linden Hall Studios in Deal and the Penwith Gallery in St Ives, Cornwall. There have been international forays to the Netherlands, Italy and Wisconsin University, USA. All of these events came to fruition due to members’ ideas, vision, organisational skills and sheer enthusiasm for contemporary art in all its forms. At present The London Group has more members than at any point in its history and continues to function without style or dogma, being the only democratically run group which survives into the 21st century. There have been just over 400 members in the Group’s history. This page includes details on the founders, the presidents and all the rest. Despite The London Group celebrating its One Hundredth Anniversary in 2013 no complete history of the Group has ever been written…that is, until now! “The London Group: a history 1913-2013” written by David Redfern, a current member of the Group, tells the story of this well known artists’ exhibiting cooperative from its origins as an enlargement of the Camden Town Group in 1913 through one hundred years of triumphs and tears to the vibrant and enthusiastic Group it is today, all set in a cultural, social and geographical context. David Bomberg, sapper, Royal Engineers, sent to the front shortly after getting married. Sydney Carline, pilot, Royal Flying Corps, shot down and wounded over the Somme but he survived. Jacob Epstein, Royal Fusiliers in the Ypres Salient. Henri Gaudier-Brezeska died in 1915 leading a cavalry charge in the French Army. He had little regard for his own safety and received a decoration for bravery before he died. He just had sent wonderfully evocative drawings to the second LG exhibition from the front. Charles Ginner, Royal Army Ordnance Corps and Intelligence Corps. Henry Lamb, medical officer, Royal Inniskilling Fusiliers. He was badly gassed in 1918. John Nash, Artists’ Rifles, went over the top in 1917. Out of 80 men all but 12 were hit in the first few minutes. He was one of the few survivors. His painting Over the Top is in the IWM. Paul Nash, also Artists’ Rifles, was in the Ypres Salient until invalided out in 1917, a few days later most of his unit were killed in an assault. CRW Nevinson, Friends’ Ambulance Unit on the Western Front and then RAMC in Wandsworth. William Roberts, Royal Field Artillery. Edward Wadsworth, as a naval dock officer and a Vorticist painter, supervised the dazzle camouflage painting of warships, so striking, like giant cubist sculptures at sea! HS Williamson, Kings Royal Rifle Corps was wounded at least twice while at the front. Percy Wyndham Lewis, officer, Royal Garrison Artillery in the Ypres Salient. Finally I would like to remember Harold Gilman, the well-respected first president, who died of Spanish ‘Flu in 1919, transmitted by soldiers from the USA arriving in Europe to fight. His death was a great loss to the Group. “The second London Group exhibition, in March 1915, saw brutal war images with Nevinson’s paintings of machine warfare, dispelling any myths of personal heroism. 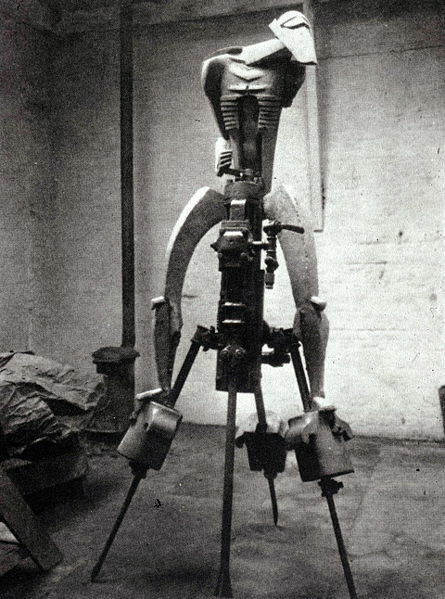 This was the exhibition where Epstein showed his famous Rock Drill and after the show he hacked the limbs off the figure to make Torso (Tate Collection) in protest of the mutilation, butchery and carnage of the war. “When the devastation of war was reaching its peak with the Battle of the Somme, in 1916, The London Group lost its gallery where it had had its first five exhibitions. This was the Goupil Gallery in Regent Street and William Marchant, the gallery owner, gave the Group an ultimatum – he had decided to refuse to show conscientious objectors. At a special LG meeting it was unanimously agreed to reject his terms. This was a brave and highly principled decision because it risked rendering the Group homeless. In fact Mark Gertler and Adrian Allinson were conscientious objectors and later Duncan Grant was also. Luckily Sir Ambrose Heal of Heal’s in Tottenham Court Road came to the rescue and the Mansard Gallery on the top floor of the store became the home of The London Group for the next eight years. 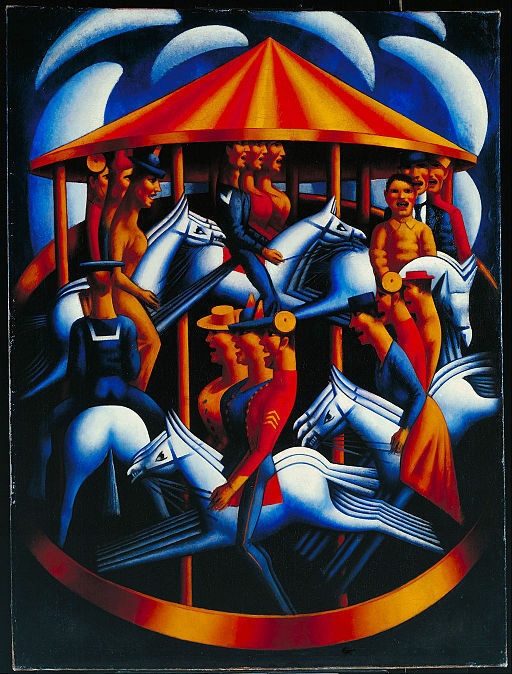 The first London Group exhibition there, in April/May 1917, the sixth LG exhibition, saw the controversy of Mark Gertler’s hugely provocative Merry-Go-Round expressing the frenzy of mechanised chaos.